One of the best things about getting away for the weekend to my sister’s cottage at Gull Lake in central Alberta is visiting some great local producers in the area. One of my go-to spots in the Pik n’ Pak – a small warehouse ten minutes off the QEII owned by two shareholders, Gull Valley Greenhouses and Doef’s Greenhouses. The warehouse has a door to a cooler stocked with fresh produce – but you have to bring cash and your conscience, because you tally up your own bill and put the correct amount of cash in a safe. Pik n’ Pak was celebrating its 30th anniversary the last time I was up, so we got to tour the facility and enjoy a taste of the produce including tomatoes. For the event, Cilantro and Chive was on site catering up dishes featuring the local produce including a gazpacho and bruschetta. After enjoying a few samples, we stocked up on a couple of cases of fresh cocktail tomatoes, eggplants, butter lettuce, and peppers and were on our way. Our next stop was the Bentley Farmers Market held every Saturday from the May long weekend to the September long weekend, in the Bentley Curling Rink and Parking lot from 1:30 – 3:30 p.m.
We arrived at 1:38 p.m. to a packed house and a full food frenzy going on outside. Products were selling quickly so we claimed the last two pails of strawberries at the first booth and bought the most beautiful purple onions for just $2. Everything seemed new and I loved walking around to see all the vendors produce, products and innovative advertising. After stocking up on more vegetables we headed outside to check out a few more producers and the assortment of vendors selling everything from Ukrainian food to gourmet tarts. Since I couldn’t partake in the gluten-fest at the Pik n’ Pak I was getting a bit hungry so we visited The GOOD Stuff food truck who had a few gluten free options. While The Spaniard downed an Alberta lamb burger, Shawna and I shared the pork carnitas tacos and meat salad. Even though we were stuffed we couldn’t help but dig into a bag of baby carrots we got from a Hutterite booth when we got back to the car – just brush of the dirt and dig into the sugary sweet carrots. On our way back to the cottage we stopped in at Brown Eggs and Lamb, just a few hundred meters from the Pik n’Pak, to pick up some fresh eggs. We were surprised to see that owners Laura and Cal were having a celebration at the farm. There were wagon rides, 4H kids showing off sheep, a band, and samples of ice cream and tea. Once I got to feed and pet the sheep, and grab a sample of ice cream, we went into the farm store. I love stopping in to see Laura, in addition to her free-range eggs you can pick up a variety of local products including lamb and other meats, honey, oils, produce, and local dairy from Bles-Wold and Rock Ridge Dairy. After one more pet of the sheep, we left with some cheese, green beans, eggs, and of course my favourite – some Bles-Wold yogurt. We spent just one night at Gull Lake but that was enough time to come home with a central Alberta bounty of produce, products, and treats to keep our fridge full and belly happy. 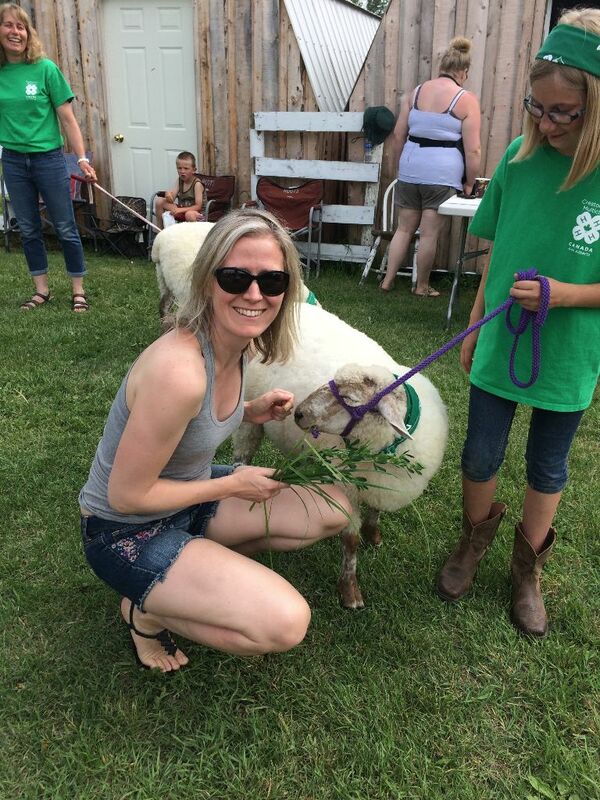 Forget gasoline alley – the next time you are driving between Calgary and Edmonton – head west towards Bentley and stop in at Gull Lake for a taste of a rural farmer’s market, the Pik n’ Pak and Brown Eggs and Lamb.